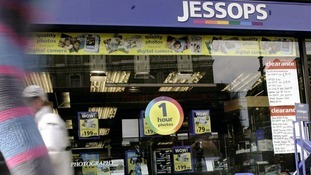 By the end of today Jessops, which has been on our high streets since 1935, is likely to be in administration, the first big name to go under in 2013. The company has battled off hard times before, avoiding administration in 2009 when they did a deal with their lenders to stay afloat. But now a combination of our growing habit of snapping and sending pictures on our mobile phones, and tough trading conditions on the high street, appears to have beaten them. As ever with administrations, a buyer could be found for part, or even all of the business. But it is unlikely that even under the best case scenario, all of the more than 1,000 jobs and 200 or so stores will be saved. Indeed in recent months, some shops have already been closing. The firm's former chief executive, Trevor Moore, who is now trying to save HMV, had been credited with turning the business around. But evidently, the changes that he made did not go far enough. And even for successful businesses, there is no sign of the grim conditions changing. The boss of Sainsbury's, Justin King, who revealed very healthy results this morning, told me he sees no sign of customers having any more to spend, or evidence that the economy is beginning to turn around. He says the supermarket has been able to grow for a striking 32 quarters in a row because they have been quick to respond to customers' behaviour. Their significant growth in online shopping and smaller shops on the High Street are an important part of the reason why they have stayed ahead of the pack. But also too is their use of data that tracks our behaviour through Nectar Cards. Like Tesco, (which reports tomorrow) and crucially unlike Morrisons whose results were disappointing this week, their loyalty scheme allows them to track customers habits and then target them accordingly with vouchers and special offers. King repeated his call to the government to suspend employers' national insurance payments for a year for new staff, believing that could snap the economy out of the doldrums. Yet without big changes there is little that will ease conditions for successful businesses, and nothing to provide much comfort for those who are battling to stay in the game. And while Jessops may be the first casualty of 2013, they are unlikely to be the last.